We lounged in our chairs moving slowly along a shoreline, noticing blue herons, baby map turtles, lots of fish and insects, enjoying the sun, the breeze and our summer job. There are never any complaints when you spend all summer doing something you love with people who love it too! That was my summer job with Watersheds Canada. I came back from my first year at Queen’s University and spent quite some time looking for a summer job in my small town that was also in my field. 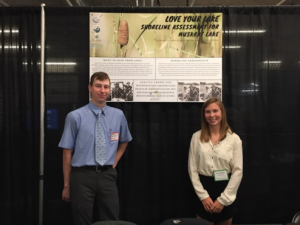 After searching and searching I got word from a friend that Watershed’s Canada was hiring for summer students to work on their Love You Lake program. Right away I was interested and after going through the interview process I was chosen to work with them this summer. How lucky was I?! A summer spent on a boat with three other students surveying properties on a lake that we all know well, nothing more I could ask for! We spent 5 days filling out datasheets, taking pictures and having fun. We met locals and property owners that wanted to learn about the program, and the response we got was always very welcoming and full of interest. All the property owners wanted to know what they could do to help and provided us with information we needed if we were confused with property lines or owners! I learned a lot this summer about healthy shorelines, what they look like and how to create one! 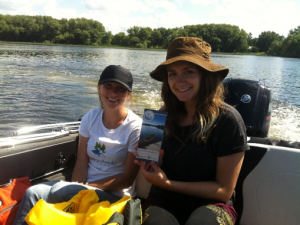 The Love Your Lake training was very educational and it helped us so much during the surveying process! This job was always fun, interesting and it has taught me a lot about myself and my future goals! I am more interested in lake ecology and in studying that within my degree. This summer job has been a wonderful and fun experience I won’t forget!